Quick, name an animated Chinese movie for kids! No answer? Exactly. Chinese animators have long remained in the shadows of Japanese anime and gigantic American companies like Disney and Pixar. 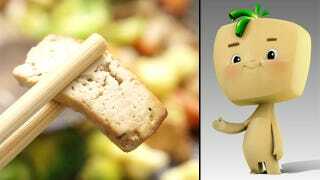 But Variety reports that the Dean of Beijing's Film Academy, Sun Lijun, is hoping to put Chinese animation on the map with Tofu Boy (working title), a feature-length movie that's a take on Pinnochio, set in present-day Shanghai. Alongside Magic Dumpling Entertainment, Sun recently enlisted an ex-Disney alum Kevin Geiger to help the film break out internationally. Says he, "I think the Chinese culture element is very important, but we need a better way to carry it to the rest of the world. Kevin (Geiger) can give us a more international platform." The movie is slated for a holiday 2013 release. Left image via Lars Kastilan/Shutterstock, right image via The Informed Vegan.